This black 545 standard stapler from Swingline boasts reliable stapling performance. A full rubber base provides stability and prevents skidding. Antimicrobial protection keeps your hands germ-free. The 545 easily opens for tacking ability, too. Staples 2-15 sheets. The Premium Pack comes with stapler, staple remover, and 1,250 S.F. 4 Premium staples. Product number SWI-54567. I was bothered that because of the great price of the package, that the stapler might be a bit cheap. However, I was wrong. It works wonderfully and I was pleasantly surprised. I was placing some reports together & realized I didn't have a stapler at home. So I purchased this and it was delivered quickly. All reports are stapled and looking great. Welcome to MyBinding video. 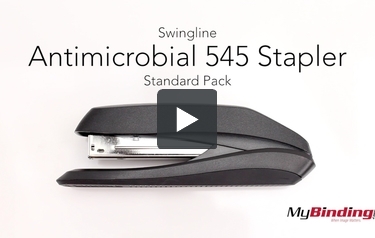 The is the Swingline Antimicrobial 545 Stapler Standard Pack. In addition to the stapler, there's a stapler remover and a pack of 5,000 standard staples. To add staples, pull on the top plastic cover while holding down on the base. Do not put your fingers under the stapling mechanism. Place your staples in and close the cover. You can do a quick test staple to make sure that your staples do indeed work. Here it is stapling the maximum of 15 sheets. It takes some pressure but nothing straining. And here's the quick look at the front of the staple on the pages and the back. You can open the whole mechanism by holding the metal shaft and pulling the base away from it. Now you can staple pages to other surfaces. It's made of an antimicrobial plastic and it's very light. But the base does slide fairly easily. Here's a look at how to remove staples. It may be easier to get one side of the teeth under the staple first, then use both to pull it out. If it doesn't come out completely, finish it off with your fingers. For more demos, reviews, and how-to's, go to MyBinding.com.